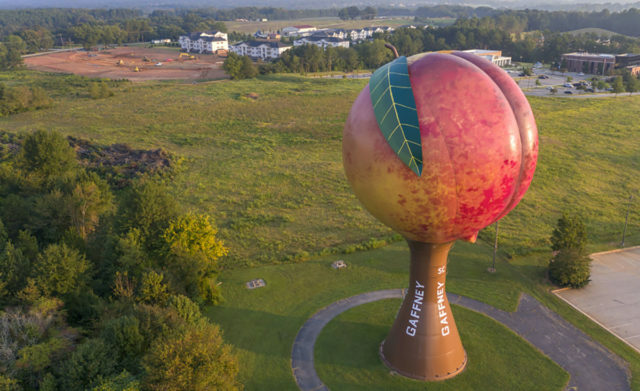 The Peachoid water tank in Gaffney, South Carolina is a vibrant, realistic depiction of a giant peach that has emerged as one of the most famous water tanks in the United States. The exterior of the water tank was refinished with Tnemec’s Series 700 Hydroflon, a high performance fluoropolymer. Due to its superior color and gloss retention properties, the Peachoid was revitalized to the point where it resembled the original color palette used by artist Peter Freudenberg. Tnemec’s Hydroflon utilizes Lumiflon FEVE resin technology, making it an ideal coating for a high profile structure like the Peachoid Water Tank. FEVE resins protect architectural surfaces from coating degradation caused by exposure to the elements. Because of these high performance fluoropolymers, coatings can withstand the pressures of UV radiation, water, and salt for extended periods of time. Lumiflon FEVE resin provides durability and longevity to any coating system, eliminating the need for recoating thus reducing lifecycle costs. In 2017, the Peachoid won the “People’s Choice” award during Tnemec’s 2018 Tank of the Year Competition.